Ronald Maynard Roach passed away December 5 with his family by his side. Known as Ron, Ronnie, Pop and Punkie his sense of humor, positive attitude and devotion to family were a constant in his life. Born in Buffalo, New York on December 16, 1929, his family moved to Southern California when he was three. He graduated from Huntington Park High School. He proudly served in Korea as a United States Marine from 1952 to 1954. With his wife of 56 years, Betty Elizabeth Louise Roach (Kerr), they raised their family in Lakewood, California retiring in the 1990s to Sisters, Oregon. He moved to Willamette Oaks in Eugene in 2013. Ron said "Hello!" to everyone. Then, he would tell stories and jokes. His stories were sometimes funny, as were the jokes - which never ended! He loved to laugh and neighbors could hear him from all the way across the street. He didn't partake in "mind-altering beverages" and he always said his meal was "the best ever!" Ron made everything more efficient. The last few years, his tools were blue tape, binder clips and Sharpees! He built and sold 24 gorgeous ski/race boats out of mahogany in the late 50s. During his life-long career as a machinist, he worked on huge turbines, parts that helped take us to the moon and the Disneyland train. He volunteered as a greeter at the Sisters Chamber of Commerce, Stitching Post Quilt Show and Green Ridge Lookout. At Willamette Oaks, he walked the halls and said hello. He joked with the staff and helped deliver the mail. 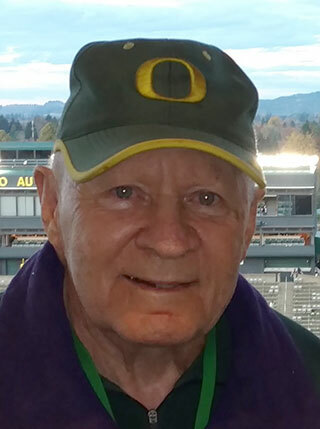 He approached his hobbies with gusto which included skiing, off-road motorcycles, RVing, garden railroads and Oregon Ducks football. Pop brought joy to his family and for this we will always be grateful. He was preceded in death by his parents Maynard and Martha Roach, sister Nancy Sowers and wife, Betty. He is survived by his two daughters Ronda Oaks (Carl Catone) and Ronnel Curry (Robert Roman), three grandsons William Oaks (Nicole), Marshall Curry (Nelya), and Miles Curry and four great grandchildren. A Celebration of Life will be held at Willamette Oaks on January 5, 2019 at 2 p.m. In lieu of flowers, please say hello to those you pass today and every day.